Monrovia, Liberia- What seemed like almost turning into a full wrestling match between two officials of government was visible when social media was rocked last night with videos of Representative Edwin Melvin Snowe, Jr., and Minister Eugene Fahngon seen engaged in a fierce argument at a police depot in Monrovia. In several videos circulating Facebook, Deputy Information Minister, Eugene Fahngon can be seen yelling at the top of his lungs; insulting and accusing Representative Snowe of abuse of power. According to several sources, the saga begun when an individual who goes by the name Kelvin Mattaldi and works at the Liberian Legislature, recorded a video and took photos of Minister Eugene Fahngon dancing at a local bar in Monrovia. Our sources say, after Mr. Fahngon observed Mattaldi recording him and taking his photos, he immediately contacted the police, and they arrested and detained Mattaldi at a local depot. Meanwhile, during the period of the arrest, Mattaldi contacted Rep. Snowe to come to his aid, and the Bomi County lawmaker showed up at the police station in no time. Sources say, after Snowe showed up, he became a bit aggressive with police officers which then irritated Fahngon that led to the verbal exchanges between both men. However, Snowe seemed a bit calmer then Fahngon who was using many expletive words in the recording, as he (Snowe) was doing audio recording while the Deputy Information Minister was doing Facebook Live. Many Liberians who commented under the one of the video shared by our sister organization Gbana TV, expressed serious disappointments on the part of both officials. Some say, while it seemed Minister Fahngon might have been right, his approach was totally wrong, especially with the insults and threats directed at Hon. Snowe. On the other hand, some Liberians said, Hon. Snowe had no right showing up and demanding the release of Mattaldi who in fact fought and tore the uniform of two police officers. It is being reported that Mr. Kelvin Mattaldi slept in jail last night and that investigation into the matter will be concluded by 11:00am today. 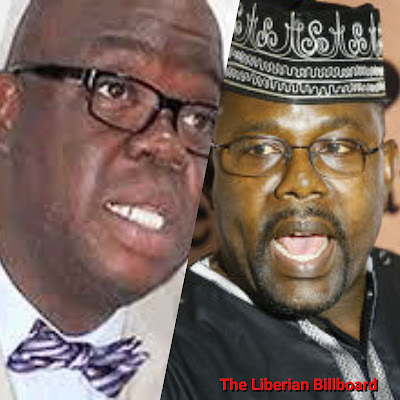 Efforts by The Liberian Billboard to get in touch with both men proved futile.